Treyarch have accidentally leaked an image from the DLC 2 pack for Black Ops 3. This image contains a very clear screenshot of the new zombies map which is now confirmed to be an island/swamp - similar in many ways to a remake of the Japanese Shi No Numa map from World at War zombies. 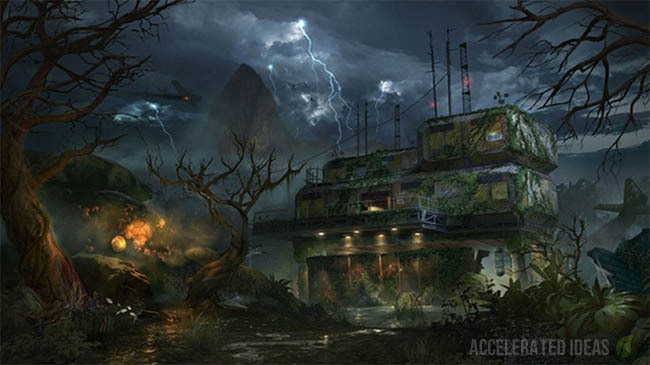 Update: Treyarch have confirmed that Zetsubou No Shima is the DLC 2 zombies map in Black Ops 3. Usually when we get these leaked images they're taken on a crappy mobile phone or from a leaked promotional image but this time around we've got a HD image of the new zombies environment! It clearly shows some of the maps unique features which I'll discuss in more detail further down this post. It's only a matter of weeks before DLC 2 is available for PS4 players, literally 2 - 3 weeks if the annual schedule holds. My guess is that the DLC 2 map will be released on either the 5th, 12th or 19th of April. There should also be a trailer coming either this weekend (20th) or early next week possibly on the 22nd March. This map is clearly alot darker than Shi No Numa and even Der Eisendrache for that matter. The sky's lit up from a violent lightning storm and that storm may explain the downed plane which is shown to the right of the secret facility. Could this be the beginning of the map, do the four characters get downed on this swamp area and must once again escape from the swamp alive? 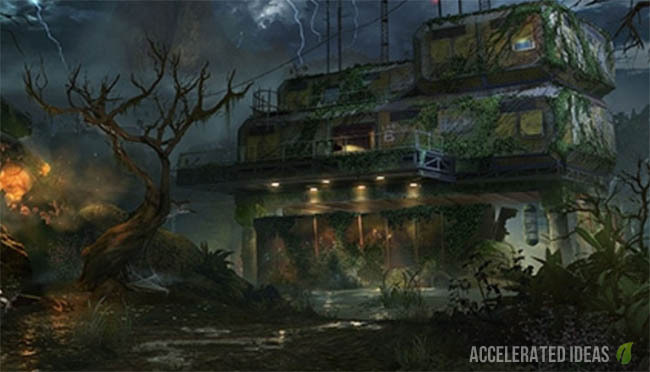 One look at the leaked image tells you that this map is set in what appears to be a jungle with swamp characteristics. There's a significant area of water in front of the facility and low lying foliage scattered around. The facility itself has been plagued by the swamp plants which have consumed a large proportion of the outer walls. It's muddy, murky and dam right boggy. A classic "lost" island setting you could say. Check the violent storm going on in the backdrop of the leaked image. The second plane is clearly having trouble flying in and there are several lightning strikes raining down from above. Could these same strikes be part of the Easter Egg, do we have to power up those radio masts to make a distress call? Did you notice the two planes in the image, the one that's downed on the right and the other that's clearly flying in the top left corner. My guess is that the downed plane is how the characters arrived here but what about the second? Is that a Mob of the Dead plane? It certainly looks very similar with a classic WW2 feel to it. 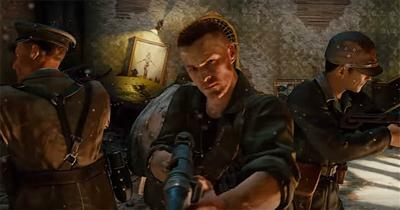 Treyarch have already confirmed the close connection between Black Ops 3 zombies and the Mob of the Dead map from Black Ops 2. The planes in this map seem to refer back to that episode again. In the left hand side of the leaked image there's a strange glowing orb which appears to have emulated from fungus or mushrooms. There has already been speculation (through the game code) that spores would offer rewards in a similar way to the tentacles from Shadows of Evil. Putting that data mined code together with the image here and I think we can confirm that random drops will appear from these spores. I could be wrong here but that cables running from the top of the facility across to another building certainly look alot like zip wires. Maybe they could just be regular cables but given that this map is taking alot from the WaW style of zombies I wouldn't be surprised to see zip wires. Don't forget that in Der Eisendrache we got the launch pads which were very similar to those from Call of the Dead. Could these zip wires also be a throwback to past features? I already mentioned the water feature directly in front of the secret facility but how deep does that water go? Is it literally a swamp pool which is only a foot or so deep or could this map have a far greater underwater aspect to it? Alot of fans have speculated that an underwater Easter Egg could be on the cards but I'm not sure this image proves that just yet. Something else also worth mentioning. Do you remember the water slides and waterfalls from Shangri-La? Could this island map contain similar features? I wouldn't be surprised to see some kind of waterfall given the island nature of this map. There's also the big question of the mountain region shown in the backdrop of the leaked image, if this region is explorable in some way then underground waterways is a sure possibility. Those radio masts look awfully familiar and even as far as to speculate that they could play a similar role to the masts in Tranzit. Will we have to use the navcards once again to complete a portion of the Easter Egg and will we have to take sides?